SAN MATEO, Calif. – Nov. 01, 2018 – Neo4j, the leader in graph databases, announced today that it has closed an $80 million Series E funding round led by One Peak Partners and Morgan Stanley Expansion Capital. Neo4j’s latest round also includes the following existing investors: Creandum, Eight Roads and Greenbridge Partners. Since its founding in 2007, Neo4j has raised a total of $160 million in growth funding – the largest cumulative investment into a graph database company. Today’s funding helps Neo4j continue to deliver customer success with graph-powered business applications, while increasing investment in the company’s flagship graph platform to support popular use cases, including graph-enabled artificial intelligence (AI) and machine learning (ML) systems. 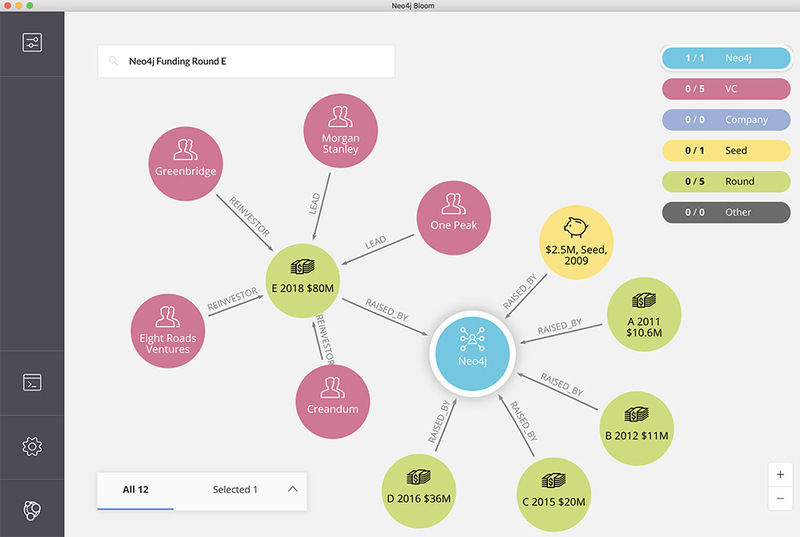 English: Neo4j secures $80 million in Series E funding, visualized using graph technology in Neo4j Bloom. With more than 300 customers, including UBS, Walmart, eBay, Adobe, Volvo, Orange and AstraZeneca, Neo4j is the world’s most widely deployed graph database, enabling connected data applications for more than 75% of the Fortune 100. Neo4j’s clear category leadership has attracted a thriving ecosystem of leading systems integrators like Capgemini and EY, cloud service providers including Amazon Web Services, Google Cloud Platform and Microsoft Azure, plus a wide range of technology companies offering complimentary tools for visualization, data integration and analytics. Forrester Research, a leading global research and advisory firm, has already noted Neo4j’s leading position in the graph technology space. “Neo4j continues to dominate the graph database market,” wrote Forrester. “Neo4j released version 1.0 of the open source Neo4j property graph database in 2010 and since then has continued to deliver innovation and expand the product to support broader use cases. Today, Neo4j is used by many of the world’s largest companies in industries such as technology, travel, financial services, retail, telecommunications, and government.” Vendor Landscape: Graph Databases, Forrester Research, Inc., October 6, 2017. Emil Eifrem, Neo4j’s CEO and Co-Founder, welcomed new investment partners One Peak Partners and Morgan Stanley Expansion Capital. For more information about what Neo4j’s funding announcement means to its customers, the developer community and the database industry, view Emil Eifrem’s Blog. Neo4j is the leading graph database platform that drives innovation and competitive advantage at Airbus, Comcast, eBay, NASA, UBS, Walmart and more. Thousands of community deployments and more than 300 customers harness connected data with Neo4j to reveal how people, processes, locations and systems are interrelated. Using this relationships-first approach, applications built using Neo4j tackle connected data challenges including artificial intelligence, fraud detection, real-time recommendations and master data. Find out more at neo4j.com.